0 for 4, it looks that NC Racist Republican led Legislature is out of luck… again. 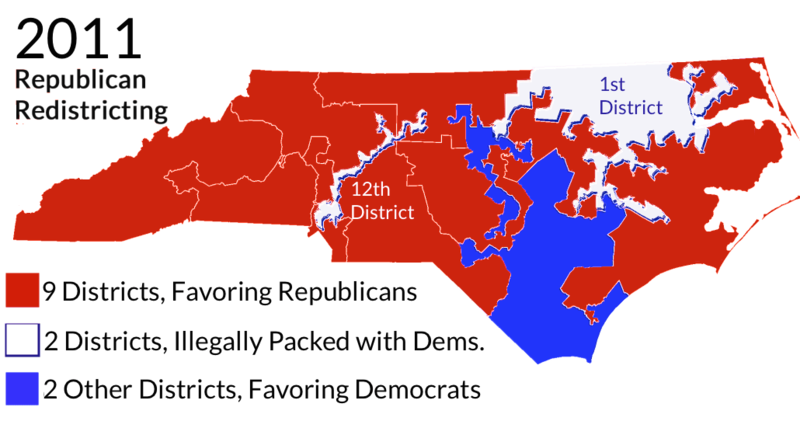 Up Next is the North Carolina Racist Republican Gerrymandering of districts. Likely up by this fall is the legality of stripping Education Funding from Democrat and minority districts. The Supreme Court will not consider reinstating North Carolina’s 2013 voting law that a lower court ruled discriminated against African American voters, the justices said Monday. Although Chief Justice John G. Roberts Jr. took pains to note that the court’s decision did not reach the merits of the case, Democrats, civil rights groups and minority groups celebrated the demise of the law. It was one of numerous voting-rights changes passed by Republican-led legislatures in the wake of the Supreme Court’s 2013 decision striking down a key section of the Voting Rights Act that effectively removed federal oversight of states with a history of discrimination. The appeals court did not allow the law to be used in the 2016 election, and voters replaced Republican governor Pat McCrory with Democrat Roy Cooper. Cooper and the state’s new Democratic Attorney General Josh Stein told the Supreme Court they did not want to appeal the lower court’s decision that the law violated the Constitution and the Voting Rights Act. “We need to be making it easier to vote, not harder — and the court found this law sought to discriminate against African-American voters with ‘surgical precision,’ ” Cooper said in a statement after the Supreme Court acted. “I will continue to work to protect the right of every legal, registered North Carolinian to participate in our democratic process. “Given the blizzard of filings over who is and who is not authorized to seek review in this court under North Carolina law, it is important to recall our frequent admonition that ‘the denial of a writ of certiorari imports no expression of opinion upon the merits of the case,’” Roberts wrote. Last summer Roberts and the court’s other conservatives — Justices Anthony M. Kennedy, Clarence Thomas and Samuel A. Alito Jr. — said they would have allowed the law to be used in the 2016 elections while the appeals continued. But they were unable to find a necessary fifth vote from one of the court’s four liberals. 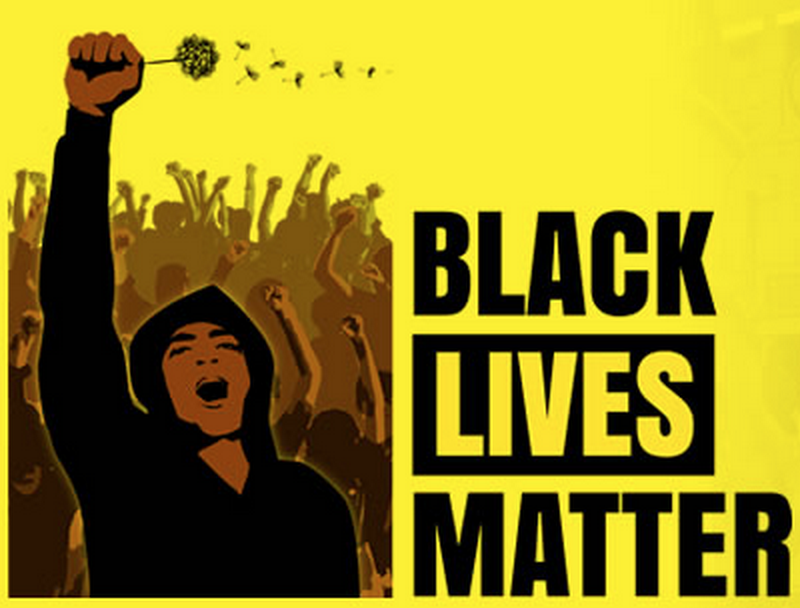 The battle against the law, considered one of the nation’s most far-reaching, consumed years of litigation by the Obama administration and a wide coalition of civil rights organizations. “An ugly chapter in voter suppression is finally closing,” said Dale Ho, director of the ACLU’s Voting Rights Project. “Today we experience a victory for justice that is unimaginably important for African Americans, Latinos, all North Carolinians, and the nation” said Rev. Dr. William J. Barber II, president of the North Carolina NAACP, the lead organizational plaintiff in the case. North Carolina legislative leaders did not immediately respond to a request for comment about what the next step may be. The Supreme Court will soon rule on a case about whether the state’s congressional districts were racially gerrymandered, as a lower court found. And federal judges have also said the state must redraw state legislative districts for the same reason. That decision is being appealed. In the voting rights case, a unanimous panel of the 4th Circuit on July 29 agreed with allegations from the Justice Department and civil rights groups that North Carolina’s bill selectively chose voter-ID requirements, reduced the number of early-voting days and changed registration procedures in ways meant to harm African Americans, who overwhelmingly vote for the Democratic Party. 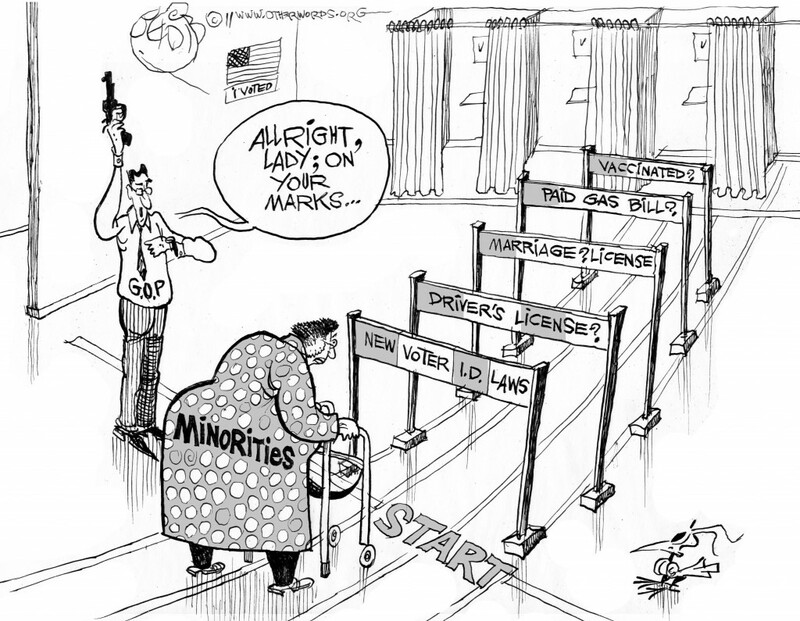 The New Jim Crow was just validated in North Carolina by a Republican Bush appointed Judge. Is it any wonder they are so desperate to maintain their 5 Thugs in Robes majority on the Supreme Court? Schroeder’s decision to uphold the law was not unexpected. The plaintiffs have already vowed to appeal the decision to a federal appeals court…. On Monday, residents of North Carolina are taking the state to court, arguing that North Carolina legislators designed a new voter ID law to stifle growing minority turnout that threatened the Republican majority in Raleigh. The NAACP is also arguing that the legislature intentionally waited until the Supreme Court struck down key protections in the Voting Rights Act before going forward with the ID law and other provisions. Before that controversial ruling, North Carolina was one of several states with a history of race-based voter suppression that had to ask for federal pre-clearance before changing any of its voting laws. “The lawmakers sat on this bill, waiting until the Shelby ruling came down, then passed this monster legislation,” Lieberman said. Though the legislators rushed to tweak the voter ID law just as civil rights groups were preparing to file a lawsuit, a court ruled that the case could still go forward. 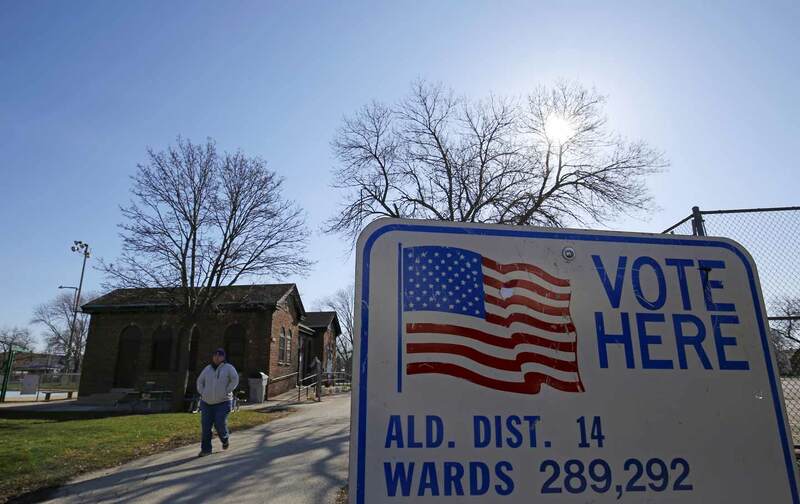 Under the version currently on the books, residents who don’t have one of the proper forms of ID can still cast a provisional ballot, but only if they fill out a form explaining why they faced a “reasonable impediment” to obtaining an ID. They have disenfranchised the voters. On Wednesday, the state of Alabama announced that it was shutting 31 driver’s license offices because of budget cuts. Two columns on Al.com subsequently noted that the cuts—which come on the heels of a 2011 law that requires voters to show government-issued IDs—will disproportionately affect counties in the state’s largely Democratic “black belt” region. Columnist Kyle Whitmire writes that 29 of the state’s 67 counties will now lack a driver’s license office—and, depending on whether you define the “black belt” as constituting 18 or 24 counties, either 12 or 15 of those newly office-less counties will be in the historically black area. Two-thirds of counties in the narrowly defined “black belt” will lack now a driver’s license office (12 of 18); only one-third (17 of 49) of other counties will lack one. 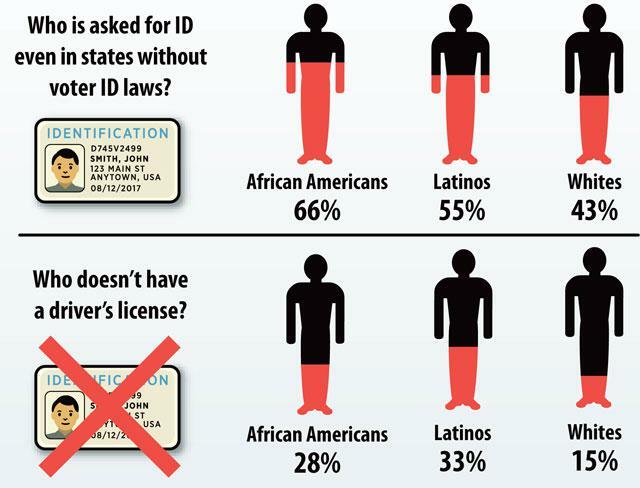 Columnist John Archibald, meanwhile, observes that no Alabama counties in which more than 75 percent of registered voters are nonwhite will now have a driver’s license office. Another way of framing the issue: Offices will be shuttered in the five counties whose voters most strongly supported Barack Obama in the 2012 presidential election. Alabama Gov. Robert Bentley is Republican, and the state’s Senate and House of Representatives are both GOP-controlled.